If you want to start a new Easter tradition this year, you can’t go wrong with an Easter egg pinata. This is basically the ultimate Easter decoration – it looks amazing, and the kids can smash it open on Easter morning to find it filled with treats! Don’t worry about it being hard to make either, it’s actually really easy! We’ve broken down how to make a pinata with simple, clear pictures and steps, so just follow along and enjoy! It doesn’t have to be a certain type of balloon or a certain size or anything, just go with whatever you’d like! Tear a few sections of the newspaper into 3″ by 4″ strips. You don’t have to be exact, but 3″ by 4″ size strips are just easier to work with. You will want your work area to be protected so put some plastic or paper over your table or work area. Then, in a leftover plastic container, mix 1 part glue to 2 parts warm water and mix well. Dip a piece of torn newspaper into the glue and cover it with the glue mixture. Then, apply the newspaper strip to the balloon. Continue adding glue covered strips until the balloon is completely covered. Note: Be sure and prop your balloon up on some sort of container so it doesn’t roll off and make a mess. Once you’ve fully covered your balloon, let the paper/glue dry overnight. Repeat this step 3 or 4 times so you have a few newspaper layers on the balloon. Would you look at that? It’s looking like an egg already. Cut some colored tissue paper into 2″ strips. I was able to find a 40 sheet pack at the dollar store! Step 7. Cut your tissue paper into 2″ squares. Step 8. Scrunch the tissue and add a big drop of glue. Step 9. Attach the tissue square to the egg. Step 10. Continue to add more tissue. Step 11. Leave a space on top so you can cut an opening. 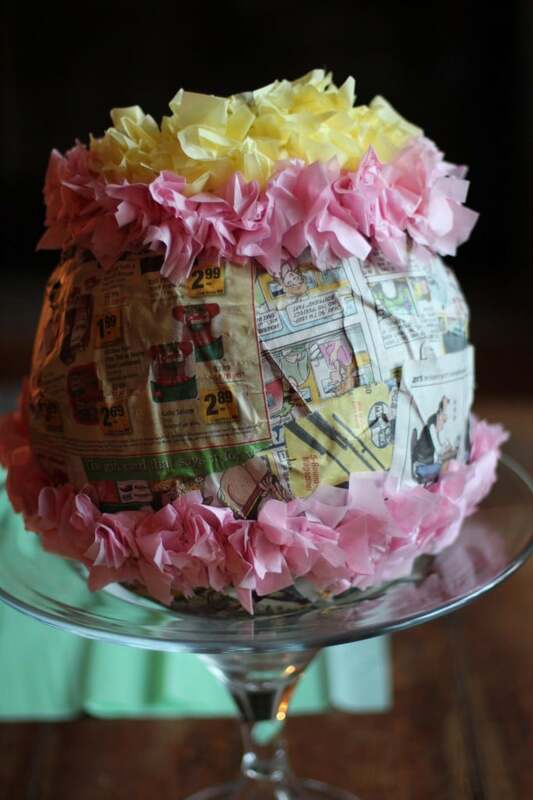 You’ll need a nice sized opening so that you can fill the egg pinata with toys or candy! Step 12. Fill the Pinata!!! Step 13. Close the opening and cover with tissue. Grab your scissors and poke a hole on the opposite sides of the egg towards the upper 1/3 of the pinata. This is where you’ll attach a rope or ribbon. Step 15. Tape a recycled ribbon onto a chopstick and thread your ribbon through the pinata. That’s How to Make an Easter Egg Pinata! It may seem a bit overwhelming at first, but this egg pinata craft is really easy once you get started! Plus, it’s totally worth the time and the kids will have a blast with it on Easter morning. Oh yeah, and the cost of making this Easter pinata? Only about 2 dollars! Find all of our Easter posts, deals, and recipes here! So cute!! Can’t wait to try this when my little one gets older! That is so cute. I can’t believe I have never made an egg pinata. I have made easter baskets….I honestly can’t remember how I did it anymore but I think the pinata sounds way more fun and I do have a lot of free candy. Fun! I WILL have to make one with my boys they would love it! Sometimes these ideas SCREAM at me that “yes you will do this” LOVE this one, so putting it together my 3 year old would love this to death and his 1 year old sister would jump right in to. Thanks for the idea, LOVE IT!!! Yes… or you could use more glue and less water and get away with doing 3 layers. I do 4 or 5 layers at once and it dries in 24 hours. I made my kid’s baskets like this only covering about half of the balloon!